It's been about a year since we last checked in with Hard West—back when it was running an ultimately successful Kickstarter campaign. Let's do so again, and... oh, would you look at that. It's robbing a bank. They grow up so fast. In the video below, you can watch as Hard West producer Pawel Kroenke runs through the game's Aspirton Bank Robbery mission. Cover icons? Movement zones? Standing completely still while a person moves up next to you and shoots you in the face? It sure is a tactical turn-based XCOM-a-like. It also looks pretty good. I like that a lot of the hassle seen in the above playthrough could have been avoided by taking out the telegraph. 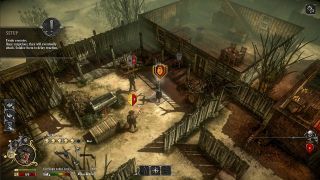 Hard West is due out this Autumn.